RRP $40. Web Price $35 (in Australia). All prices are inclusive of postage. New Zealand and overseas orders will be sent by airmail. Book Retailers: If you would like to purchase this product, please contact Gwen Harden Publishing for more information. A field guide to the rainforest climbers of Victoria, NSW and sub-tropical Queensland using vegetative characters. Rainforests of mainland eastern Australia south of the tropics. Now covers Rockhampton in Qld to NSW and Victoria. Species in vine thickets, the drier inland extensions of rainforests. More marginal, early pioneer and ‘gap’ species. Botanical names of previously unnamed species (now formally named). New species “with “phrase names” awaiting scientific description. This is a major update of “Rainforest Climbing Plants” (Williams & Harden 1980) and later reprintings with additions. It is known by many as “the Green Book”. 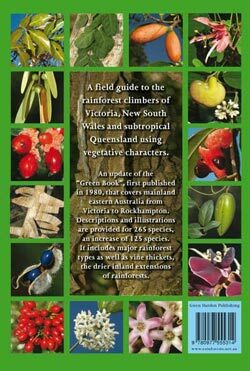 It has now been expanded to cover mainland Eastern Australia from Victoria up to Rockhampton in Queensland.. Descriptions and illustrations are provided for 265 climbing plant species, somewhat more than double that in the original edition. The new edition includes major rainforest types as well as vine thickets and the drier inland extensions of rainforests. The book provides a concise illustrated guide to the identification of rainforest climbing plants of subtropical eastern mainland Australia south of the Tropic of Capricorn at Rockhampton, thence down through Southern Queensland, New South Wales and Victoria. “Rainforest Climbing Plants” is an excellent identification guide based upon the distinctive features of the leaves, stems and branchlets. Leaf characters have the advantage that they are available for study during any season (except for a small number of deciduous species) and in most rainforest species are sufficiently distinctive to permit identification and subsequent recognition of the species. As well as the obvious points of leaf size, shape and arrangement, there are several finer characteristics such as the presence of oil dots (oil glands), hairs, scales, scaly buds, stipules, latex etc which must be checked. Information about these features is provided in several sections of the book. 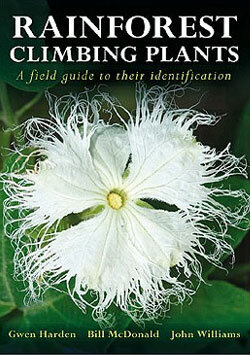 Click here to view the table of contents of the Rainforest Climbing Plants book. Back cover photos (clockwise from top left) Cissus sterculiifolia, Parsonsia plaesiophylla, Melodinus australis, Passiflora aurantia var. aurantia, Marsdenia fraseri, Palmeria scandens, Parsonsia leichhardtii, Austrosteenisia blackii subsp. blackii, Marsdenia suaveolens, Hoya australis subsp. australis, Piper hederaceum var. hederaceum, Rhynchosia acuminatissima, Caesalpinia subtropiica, Trophis scandens subsp. scandens, Ventilago pubiflora.